Everyone has an ultimate favourite biscuit, devoured time and time again over an entire lifetime of sweet treat eating. For some it's the Jam Fancy, with its gooey centre shining like an edible ruby. For others, the Iced Vovo with its melt-in-your-mouth marshmallow buried under lashings of coconut. Whatever your favourite, here's a little homage (in felted mobile form) to the classic bikkies of our youth, something you can enjoy long after you've demolished the entire tray. Cut 2 light brown circles from felt for the biscuits. You can use egg cups or little jars as a template for this. Trace around a smaller circular shape (like a glue stick cap) in the centre of each circle, then cut this out so there's a hole in the middle. Cut a red circle for the "jam", slightly bigger than the hole. 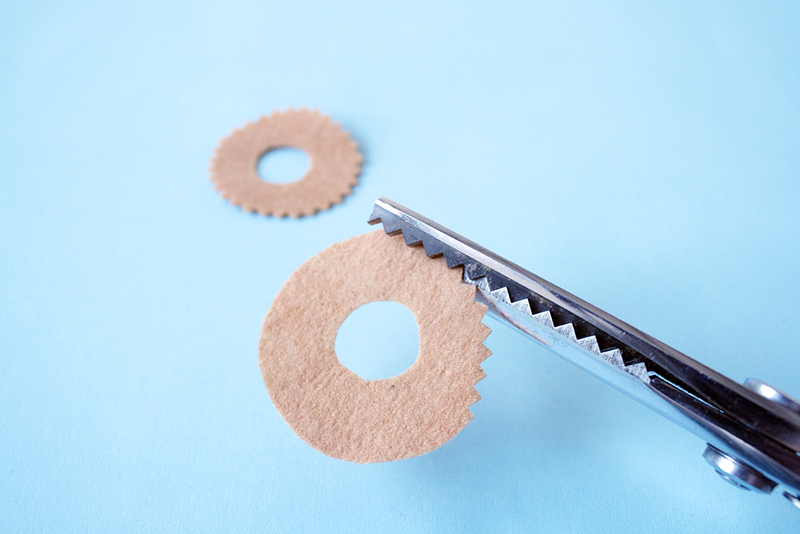 Cut a zig zag edge around each circle using the crimping shears. Sandwich the red circle between the two brown ones. Using a single strand of light brown embroidery thread, sew all the way around the edge of the biscuit as well as around the inner circle with a simple running stitch. Cut a cream rectangle approximately 5 x 4cm in size. Cut a smaller pink rectangle about 3 x 4cm in size. Cut a thin red rectangle, 1 x 4cm in size. Crimp the edges of the cream rectangle, then cut the corners of the pink rectangle into curves. Free-cut a curvy edge on each long side of the red rectangle. 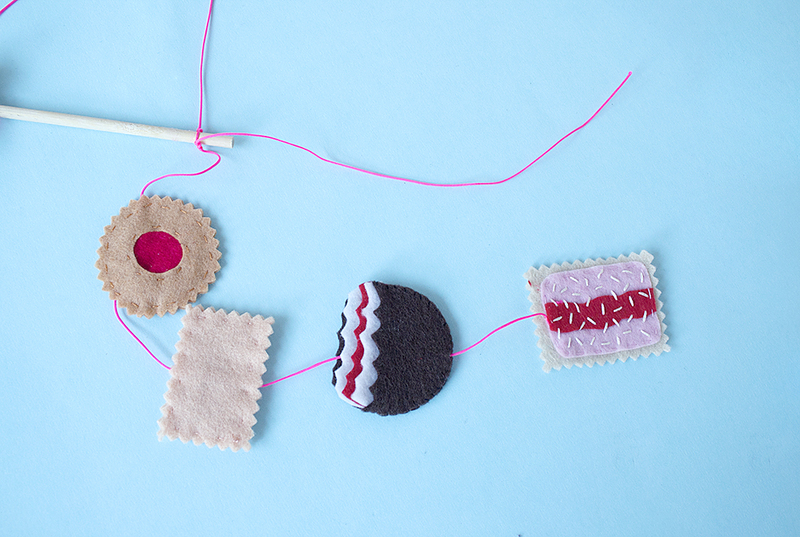 To create the biscuit "topping", use three strands of white thread and stitch the red rectangle to the pink rectangle using single stitches, sewing in all directions so it looks like desiccated coconut. Sew the topping to the cream rectangle along the edges using running stitch and a single strand of pink thread. Cut two dark brown circles, two white circles, and one red circle using the same template as the Jam Fancies. Free-cut bite marks into one brown circle, around the halfway point. Hold a white circle underneath the brown one and free-cut more bite marks, following the line of the first ones but cutting a little bit closer to the edge of this circle. Repeat these steps with the remaining red, white, then brown circles. Cut the bite marks closer and closer to the edge of the circles each time so that when you're done you will have a biscuit stack that has a bit of a 3D effect. Ooh, clever! Using a single strand of dark brown thread, stitch around the edge of the biscuit stack (sandwiching all the layers together) using running stitch. You don't need to stitch where the bite marks are. Cut two cream rectangles approximately 3 x 5cm in size. Crimp the edges of both rectangles. Use a pencil to lightly draw the word "NICE" onto one of the rectangles. This will form a guide for your embroidery. Using three strands of brown thread, embroider over these letters using backstitch. Cut a 30cm piece of the coloured yarn and tie it to the stick using tight double knots, approximately 1cm in from each end. Cut two 50cm strands and one 60cm strand of coloured yarn. 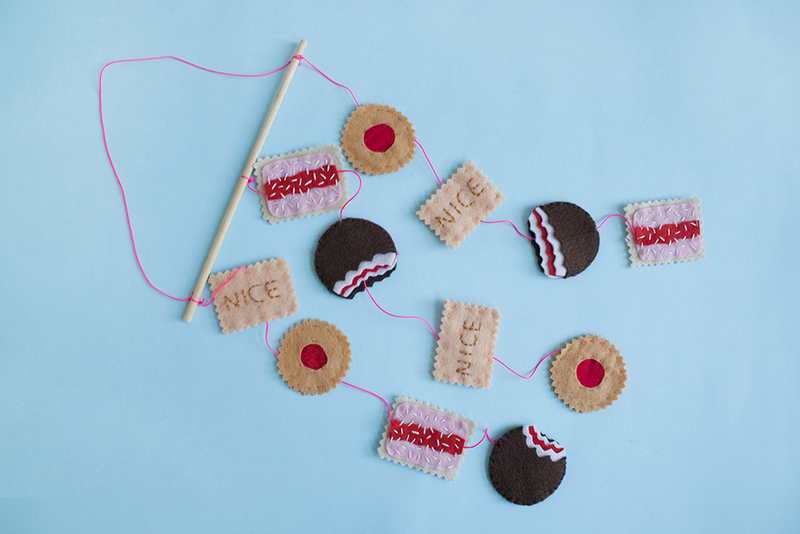 Thread four assorted biscuits onto each strand, gently manoeuvring the yarn in between the layers of each biscuit (as if you were threading a bead). Use the large-eyed needle for this. To complete your mobile, tie the two 50cm strands onto the edges of the dowel rod and the 60cm strand in the centre. Once your mobile is complete, hang it somewhere you can see it. Then put the kettle on, pull out that tray of biscuits, sit back and enjoy your handiwork!